The Mohawk Hudson Humane Society provided guidance for Sunrise Management & Consulting on pet policies and the decision to make Van Allen Apartments a Pets Are Welcome property. 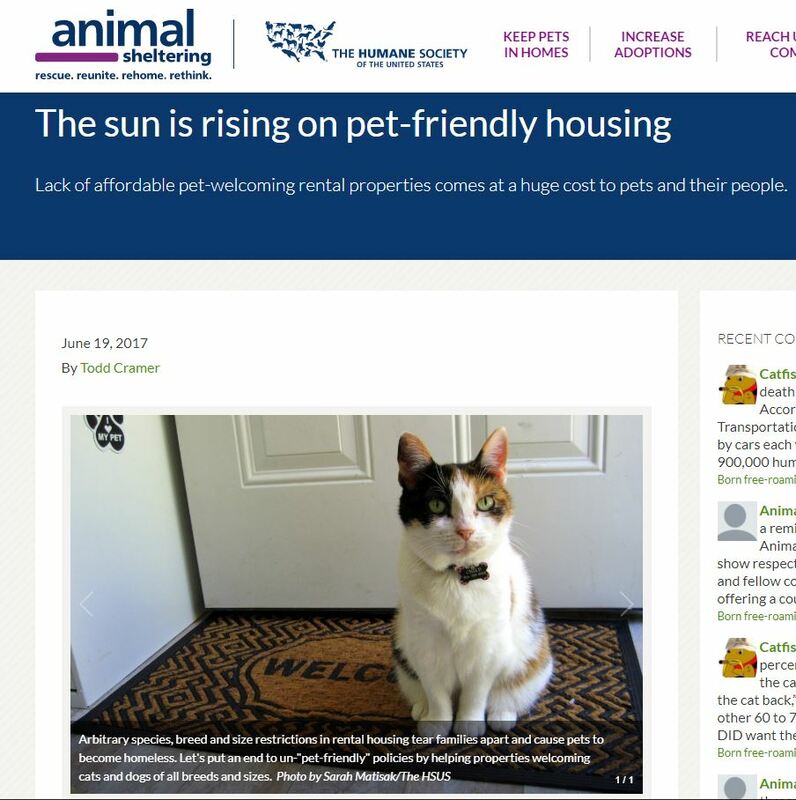 Mohawk Hudson Humane Society CEO Todd Cramer discussed this in an article for Animal Sheltering Magazine 6/19/17 entitled “The sun is rising on pet-friendly housing.” Please enjoy the article below or click on the image to be taken directly to Animal Sheltering Magazine’s website. During my time at St. Hubert’s Animal Welfare Center in Madison, New Jersey, I was privileged to work on an HSUS Pets Are Welcome pilot program designed to encourage property owners to allow pets in their rental units, and to support them with guidance and resources when they did.We quickly learned that property managers are not the decision-makers for matters of policy. But since properties were already successfully renting units without allowing pets or adjusting their current restrictions for the pets they allowed, the high-level decision-makers weren’t interested in speaking with us. With housing issues being a top reason for pet surrenders, it was disappointing, to say the least. So months later when I joined the Mohawk Hudson Humane Society (MHHS) and senior leaders from Sunrise Management & Consulting asked us for guidance when designing a new “pet-friendly” apartment complex, I thought “hot-dawg!” (see what I did there?) and immediately agreed to the meeting. The Sunrise team asked for guidance regarding whether or not to allow pets in all buildings or in consolidating all pet parents in select buildings, how to design and manage their dog parks, walking trails, which vaccines to require, how to assess pets for safety, etc. While the MHHS team provided the requested guidance, we also suggested that simply allowing some pets is no longer enough and asked the company to consider becoming an HSUS Pets Are Welcome property, allowing all companion animals, regardless of size or breed and without restriction, on the number of pets a resident could have. 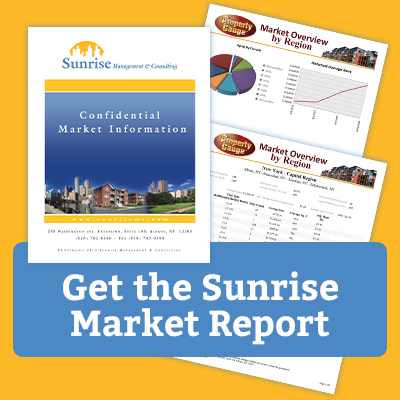 After connecting directly with the HSUS, the progressive, open-minded and animal-loving Sunrise Management & Consulting team created the Pets Are Welcome Van Allen luxury apartment homes, allowing three pets, cats included, without restriction on size or breed (pause now and do a happy dance!). Training for the apartment staff, including but not limited to what to do in a dangerous situation with a pet–for example, what should a maintenance worker do if he enters an apartment and finds a loose and protective dog? What are the basics of canine and feline body language? Training for residents, including a quarterly new resident orientation which offers tips for residing happily with pets, a dog park and walking trail etiquette, enriching the pet’s apartment environment, pet socialization, and dog training classes. MHHS staff will mediate pet-related concerns and conflicts between residents, and between residents and management, by offering solutions to the problem at hand. Residents and management have 24-hour preferred access to MHHS operations staff for assistance with urgent animal related issues. Discount on MHHS programs and services for Van Allen residents, including spay and neuter services, pet adoption, events and purchases made in our retail store. Sunrise Management & Consulting is also sponsoring the development of MHHS’s webpage for pet parents who need behavior, training, spay and neuter and housing resources. This partnership is a win-win for both organizations and, of course, pets and their people. Today Van Allen Apartments is raising the bar for all property owners who want to fill rental units more quickly and keep them occupied longer. Working together to keep pets safe has had benefits beyond the Van Allen apartments. When Lisa and her mom’s home became uninhabitable because of damage from a winter storm, Lisa felt forced to surrender her beloved golden retriever, Grace, and bunny, Bella, because she couldn’t find affordable housing which would accept her pets. The humane society cared for the pets while Lisa pursued one last rental property. The property manager, who had not allowed pets in the past, ultimately allowed Lisa and her mom to have their pets because he worked for Sunrise Management & Consulting, was aware of the success of the Van Allen apartments and felt allowing the pets was the right thing to do. The lack of affordable pet-welcoming rental properties has a huge cost to pets and their people. For me, until recently, it was an hour-long commute to work each way and the costs of keeping a second “commuter car.” For folks with fewer resources than I have, it can mean surrendering a pet to a shelter or rescue group. When humane organizations like St. Hubert’s Animal Welfare Center and MHHS support property owners and management companies who lift their restrictions on pets, we let the sun rise on pet-friendly housing so it can grow beyond “friendly” into housing that is truly welcoming to pets.